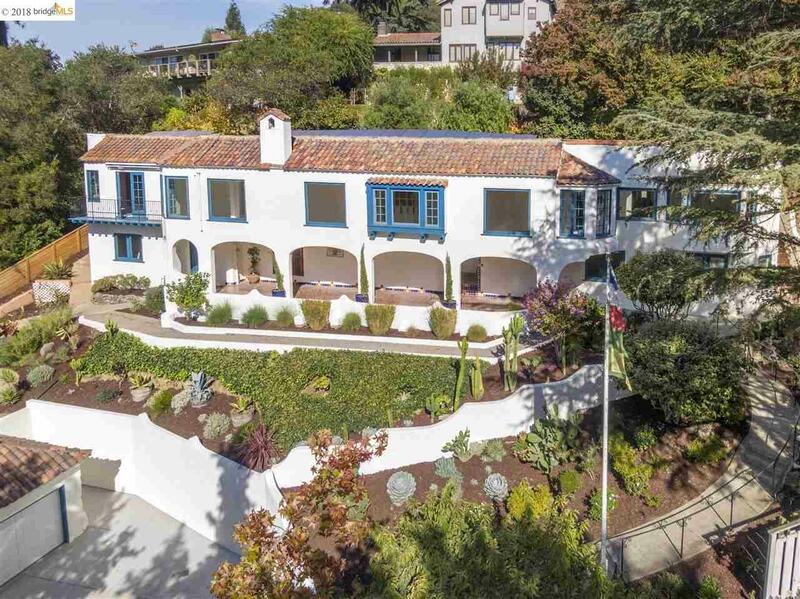 Rising majestically above its circular driveway and sculptural gardens, this dramatic Spanish Colonial Revival residence has been a neighborhood landmark since 1928, when it was one of the first homes to be built on the Piedmont Side of Montclair. Lovingly expanded and renovated over the decades, the modern, open floor plan features lovely treetop, bay, bridge and city vistas from nearly every room. Designed for serious cooking and entertaining, the handsome, open kitchen anchors the dining room, office or breakfast alcove, family room and broad rear patio; the living room and library open to the front balcony. The spacious master suite with view, balcony, steam shower, jetted tub and large dressing room leads to the rear terrace and spa. Two more bedrooms and an elegant hall bathroom complete the main level; below are a fourth bedroom with bath and separate entrance for guests, office, teen or au pair lair and a large and versatile shop/studio/playroom for artists, inventors or play.